From Flannery O'Connor and Rona Jaffe Award winner Lori Ostlund, a deeply moving and beautiful debut novel about a man who leaves his longtime partner in New Mexico for a new life in San Francisco, launching him on a tragicomic road trip and deep into the mysteries of his own Midwestern childhood. Sensitive, big-hearted and achingly self-conscious, forty-year-old Aaron Englund long ago escaped the confines of his Midwestern hometown, but he still feels like an outcast. After twenty years under the Pygmalion-like direction of his partner Walter, Aaron at last decides it is time to stop letting life happen to him and take control of his own fate. But soon after establishing himself in San Francisco-where he alternates between shoddy garage apartment and the absurdly ramshackle ESL school where he teaches-Aaron sees that real freedom will not come until he has made peace with his memories of Morton, Minnesota: a cramped town whose four hundred souls form a constellation of Aaron's childhood heartbreaks and hopes. After Aarons father dies in the town parade, it was the larger than life misfits of his childhood-a sardonic, wheel-chair bound dwarf named Clarence, a generous, obese baker Bernice, a kindly aunt preoccupied with dreams of The Rapture-who helped Aaron find his place in a provincial world hostile to difference. But Aaron's sense of rejection runs deep: when Aaron was seventeen, Dolores-Aaron's loving yet selfish enigmatic mother-vanished one night with the town pastor. Aaron hasn't heard from Delores in more than twenty years, but when a shambolic PI named Bill offers a key to closure, Aaron must confront his own role in his troubled past and rethink his place in a world of unpredictable, life-changing forces. 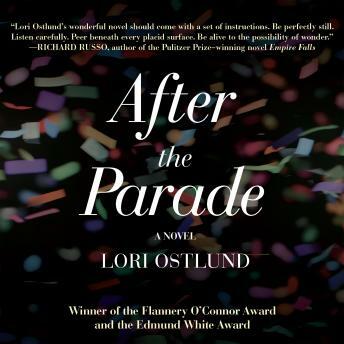 Lori Ostlund's debut novel is an openhearted contemplation of how we grow up and move on, how we can turn our deepest wounds into our greatest strengths. Written with homespun charm and unceasing vitality, After the Parade is a glorious new anthem for the outsider.